Episode 66 features our special guest Colleen Patrick-Goudreau. Known widely as "The Compassionate Cook", Colleen talks with ARZone about her recent work reaching out to people who are interested in changing their lives through "The 30-Day Vegan Challenge". She also speaks about effective advocacy, the need for people to be compassionate to human as well as other-than-human animals, and the vital importance of communicating authentically. Audio podcast, approx 64 minutes. Colleen Patrick-Goudreau holds a Master’s Degree in English Literature, and is a noted author, advocate, public speaker and educator. Through her many articles and books, including “The Vegan's Daily Companion: 365 Days of Tips and Inspiration”, Colleen reaches out to a wide audience to encourage compassionate living. 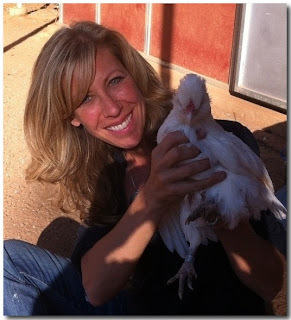 She hosts and produces her very popular podcast, Vegetarian Food for Thought, supports the work of rescues and sanctuaries, and is passionate about helping people make informed choices as they seek to align their practices with their values. Please visit Colleen on the web at The Compassionate Cook. What a pleasure to hear Colleen again. I am always so inspired by her.